On 29. 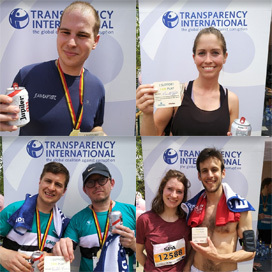 May 2016, and for the first time, Transparency International Belgium took part in the 20km de Bruxelles /20km door Brussel. 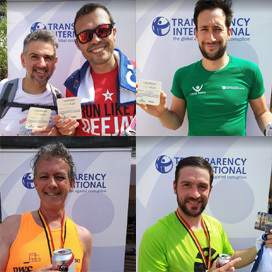 The 37th edition of the race gathered more than 30,000 runners. 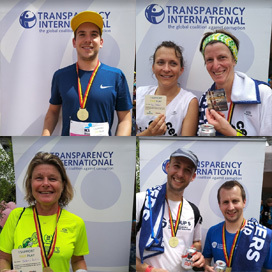 14 runners joined the TI team and ran for "zero corruption in sport". 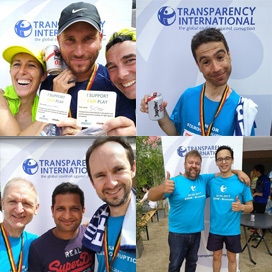 They were collaborators and members of TI Belgium, TI Secretariart, TI EU and supporters of TI. They all crossed the finish line. Congratulations to all of them! Thank you to Catherine Lallemand, 4-time winner of the race for helping our runners get ready for the challenge. 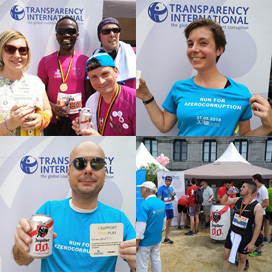 "It was so rewarding to feel the support for our "Zero Corruption in Sport" campgain last Sunday at the 20km for Brussels! 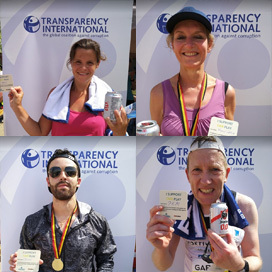 My personal objective for next year: less corruption in sport and to cross the finish in less than 2.30hrs! 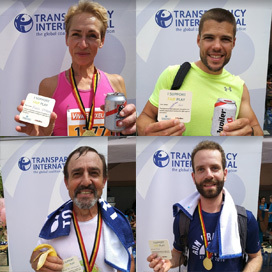 We'll keep on running and thank you Catherine Lallemand for getting us ready. I could not have done this without you." 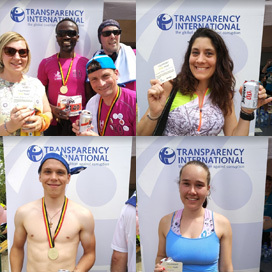 This initiative, led by Young Transpareny International Belgium, aimed to raise awareness on corruption, and especially in sports. 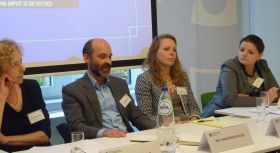 As the recent scandals, notably in football with matchfixing and doping in tennis, have shown, fair play is affected by the many forms corruption can take. 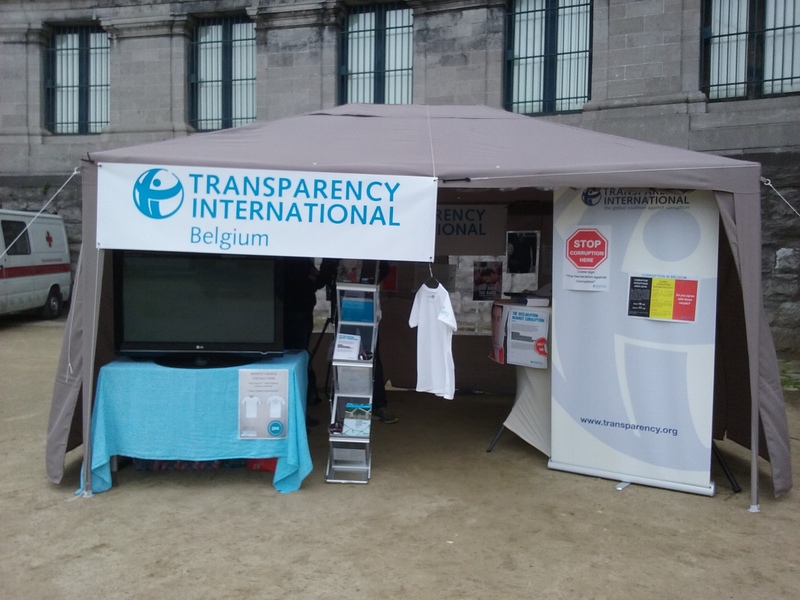 Transparency International Belgium was also represented at the race with a tent which attracted runners and passers-by. 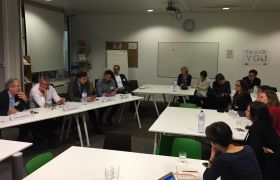 The visitors were asked to sign the "Declaration against corruption" whereby they committed to not pay bribes, seek them, pay them, or support candidates to public office who lack of integrity, accountability and are corrupt. 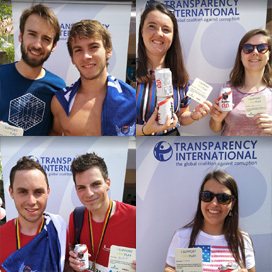 They were also asked to choose a message to support, such as "Zero corruption in sport", "no need to cheat to win", "stop corruption", "#CleanUpSports", etc. 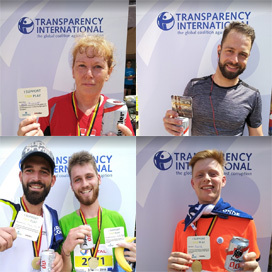 "The next edition of the 20km de Bruxelles/ door Brussel will be on 28. May 2017. We hope to see you there!" Thank you to everyone who got their pictures taken and support our cause! We hope to see you at one of our events soon. To see the pictures from the day, click here.